Conveniently located based beside the A11 dual carriageway at Snetterton in South Norfolk, Johnston Logistics offers a full range of third party logistics services in its 130-acre site with 640,000 sq ft of ambient warehousing facilities. 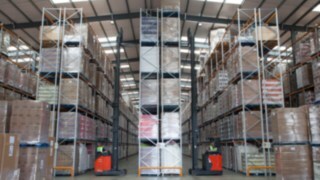 The fleet at Johnston’s consists of most model types ranging from Very Narrow Aisle trucks, reach and counterbalance, right through to ride on pallet trucks, which are continuously on the go moving around 350 pallets a week. Johnston Logistics store anything and everything from grass seed to fitness equipment and everything in between. When lifting to heights above 8 metres mast oscillation will occur and lower the operator’s efficiency and productivity. The operator has to wait until the mast oscillation has subsided before completing the storage or retrieval cycle. Linde’s Dynamic Mast Control with Electric Reach system counteracts mast deflection and oscillations generated during the lifting process resulting in a more efficient, safer operation.